Student winners and high school teachers receive a complimentary dinner; others may attend for $25 each. RSVP by Wednesday, April 7, to the Awards Night coordinator, Leah O’Brien at lobrien@siue.edu or 618-650-3562. The Awards Night will be held this year at Maggiano’s on the Boulevard (across Brentwood Blvd from the Galleria, (map). The cost will be $25 per person for all guests. Winners of the High School Chemistry Contest, the High School Chemistry Teacher-of-the-Year, and the Outstanding Junior Chemistry Students at area colleges and universities are all recognized. 2015 Battle of Burets participants and teachers representing MICDS. L to R: Madison Wrobley, Chloe Stallion, Justin Little, Elizabeth Bergman, James Meade, and Ben Hahn. On Tuesday, February 24th 2015, 34 students from 8 area high schools competed in the “Battle of Burets”. This year, the Battle was held in the new Science West building at the SIU Edwardsville campus. Along with the new location, a new competition procedure was also developed. Students competed in teams of two students, but each student completed 3 individual titrations with the scores of the teammates combined for the team score. 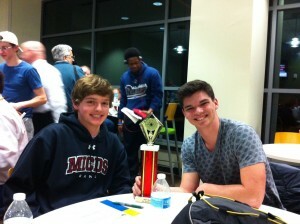 2015 Battle of Burets first place winners Ben Hahn (L) and James Meade(R) from MICDS. The top three teams received trophies and a round of applause from the other participants. In First Place were Ben Hahn and James Meade from MICDS (teachers Elizabeth Bergman and Justin Little). 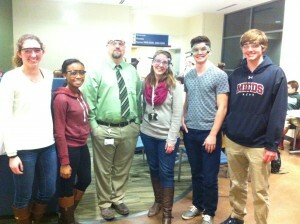 In Second Place were Noah Engel and Haley Keil from Clayton High (teacher Nathan Peck). In Third Place were Katie Krausz and Sydney Kaemmerlen from Villa Duchesne (teacher Kathy Danzo). Congratulations to all the participants! Additional details can be found at http://www.stlacs.org/st-louis-award/. The St. Louis Section of the American Chemical Society established the ACS Midwest Award in 1944 to recognize the outstanding achievements an individual made in chemistry in the Midwest Region. The award is conferred annually on a scientist who has made meritorious contributions to the advancement of pure or applied chemistry, chemical education, and the profession of chemistry. The contributions must have been made during a period of residence in the geographical area defined by the territories of the Local Sections that participate in the Midwest Regional Meeting of the ACS. These 17 Sections are listed in the programs for Midwest Regional Meetings (or call me to confirm eligibility). Nominees can work in industry, academia, government, or in private practice – they need not be members of the ACS. The 2015 Midwest Award will be presented at the 50th Midwest Regional ACS Meeting to be held in St. Joseph, MO, October 21-24, 2015. Ceremonies feature a Midwest Award Symposium and the Midwest Award Lecture. The Award consists of a medallion and a cash honorarium; it is presented by the St. Louis Section Chair at the Midwest Awards Banquet. Conditions of this Award include that the recipient gives the Midwest Award Lecture, and attends the Midwest Awards Banquet; both events usually occur on the Thursday of the Midwest Regional Meeting – October 22, 2015 this year. Nominations should consist of: a nominating letter for the nominee and two or more seconding letters; a CV for the nominee; a brief biography for the nominee; and documented and objective information regarding the outstanding achievements of the nominee. If the nominee is an academician, a list of persons who have received advanced degrees under her or his direction should be provided. Activities that support the ACS in the Midwest Region constitute an added criterion. Please submit nominations electronically via a single pdf file to the e-mail address given below. All nominations must be received on or before the deadline, Monday March 31, 2015. If you have questions, please contact Jim O’Brien or call (314) 757-5717 (cell). The St. Louis ACS Younger Chemist Committee will host a live viewing of the ACS Webinar, “How to Create a Safety Culture While Growing Your Business” on April 14 starting at 5:45 PM. The webinar will be hosted by Neal Langerman of Advanced Chemical Safety, with speakers Brian Morin of Dreamweaver International, Inc., and Ken Fivizzani from the ACS Division of Chemical Health & Safety. The speakers will discuss safety protocols and requirements and the small business challenge. The St. Louis live viewing of the event will be held at Dentons Law Firm in downtown St. Louis (211 N Broadway 3000). Save the Date, and look for more information to follow soon. Contact ycc@stlacs.org with questions. There’s still (a little) time to reserve your seats for recognition night. Honor the Distinguished Service Award winner. Meet and greet new 50- and 60-year members of ACS. Hear an entertaining and brief after-dinner talk by our immediate past chair. All the details are here. Do it by March 2. On International Women’s Day, March 8, the Women Chemists Committee (WCC) of the St Louis Section–ACS is hosting a visitor, and you’re invited to join. The location is JC Penney Building Room 202, University of Missouri–St Louis. Though the hour is traditional high tea, the refreshments are appetizers and a cash bar. The main event is a talk by Dr. Cecilia Marzabadi of Seton Hall University, who is a PhD alumna of UMSL. The title of her talk, which is also the title of a book she co-authored, is Mom the Chemistry Professor. Attendance is limited and reservations are closed at the time of this publication. The event is jointly sponsored by the WCC of the St Louis Section–ACS, the Dept of Chemistry and Biochemistry of UM–St Louis, and the Department of Chemistry of SIU–Edwardsville.